I had a very unusual mail through from Andrew who owns a 1978 Panther Lima. 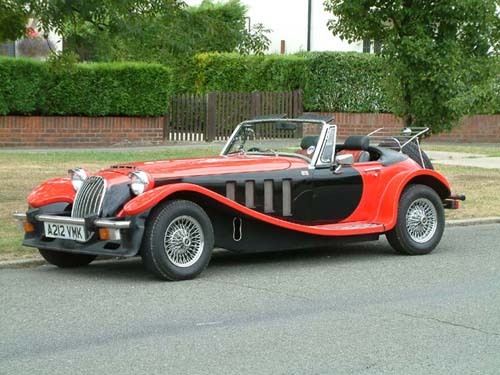 If you have never heard of a Panther before, I don't blame you, they were a rare car with under a thousand made. The styling may not to be everyones' taste, which could be best described as a vaguely 1930's sports car design, reminiscent of a Morgan, but less angular and more bulbous. It followed typical 70's kit car methods, by placing a lightweight glass-fibre shell sat atop a steel chassis. The running gear and electrics were sourced from Vauxhall and were based on the large capacity engined Firenza and Magnum models. I was surprised to see some quite impressive performance figures quoted for the Panther Lima, especially in an era where a 0-60 time under 10 seconds was the benchmark that set apart true sports cars from mere family saloons. Andrew badly needs a new indicator switch for his car and is apparently not having a much luck with either the Viva Club or the Droop Snoot Group who would be my first choice for Viva/Magnum/Firenza parts from this era. However, it looks as if eBay may be solution to his problem where a suitable item is currently on auction.